06 Şubat 2019 Çarşamba 14:01 - 3 reads. 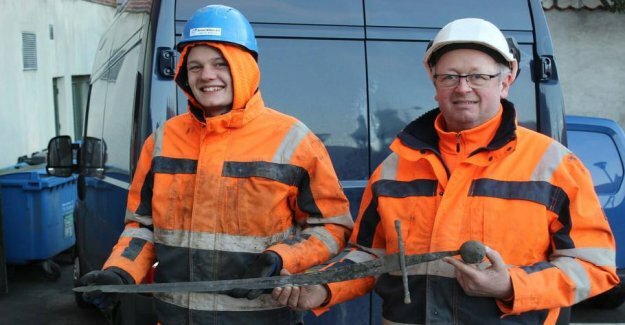 Rørlægger Jannic Vestergaard and maskinfører Henning Nøhr made big eyes, when they Tuesday discovered an intact and well-preserved sword during their work in the middle of Aalborg. The typing of the North jutland Historical Museum in a press release. The paged quickly to the archaeologist Kenneth Nielsen from North jutland's Historical Museum, so they could get dated the 112-centimetre-long sword. He could on the ground assess that the sword originated from the middle ages - specifically the 1300-century, since it lay in a affaldslag on top of the Algades oldest paving. - Finds from here have all the time pointed in the direction of 1300 years, so the sword must be turned into the soil in the century, says Kenneth Nielsen in the press release. There is talk about a sword of "extreme high forarbejdningsmæssig quality", which in English means that it has a number of details that only skilled våbenmagere have been able to make. Among other things, a so-called fullers in the blade, which helps to make it more than a meter long metalsværd amazingly easy. It weighs just over one kilo. Swords were generally expensive in the middle ages and therefore reserved for krigereliten, which in the 1300s was adlen. Therefore clipped Kenneth Nielsen of the sword, seemingly random location in a street race. Usually took the warriors literally their precious weapons with him in the grave. Våbenfund is therefore usually done in mounds. According to Kenneth Nielsen, it may point to the fact that the sword is lost under violent circumstances.